As I hugged Donalyn goodbye at ALAN yesterday, I whispered to her how amazing it is to think how my life has changed in the last five years. Five years ago, I hadn't even heard of NCTE, as crazy as that is. As a hearing itinerant teacher, I was a member of and had presented at an organization for teachers of students who are deaf and hard of hearing in Illinois but I just went to my third NCTE, presented twice and completely love it. It's hard to imagine not going to NCTE now! It's also hard - really hard - to believe that another year has come and gone already since the last NCTE. I absolutely love this conference. What I love most about NCTE is the opportunity to be surrounded by unbelievably amazing colleagues; from teachers, to authors, to illustrators and publishers. It's all about sharing reading and writing and being passionate about making an impact on students. Every year I am more and more inspired! There were a few highlights of this year for sure! One was getting to spend time with Peter Brown. After celebrating the release of Mr. Tiger Goes Wild, it was fun to talk to him about books and writing. If you haven't read Mr. Tiger Goes Wild, you can read my review here...and then I'm sure you'll be off to grab it! It's awesome. It really, truly is. Go read it. Or go read it again just for fun and to marvel and how great it is. I'm so mad at myself for not taking enough pictures this year but I do have a few to share at least and they are of my other highlights so that's good! On Friday, I presented on the topic of non-fiction picture books as mentor texts for secondary students. It was a complete honor to collaborate with Kellee, Beth Shaum and Audrey Vernick. I loved going through books I have reviewed here and pulling some great mentor texts that I have used with secondary students. It's much easier to see me in this picture! We were just about to cross the street and circle around the Boston Common! Go runners! On Sunday morning, I was thrilled to share the epic-ness of Teachers Write with Kate Messner, Gae Polisner, Jo Knowles and Brian Wyzlic. I'm still pinching myself and reminding myself just how absolutely incredible it is that I have been able to work with these fabulous people on Teachers Write over the last two summers and that we got to present our passion for Teachers Write all together in the same room. I've been inspired to write more after every NCTE but I can honestly say that my heart is really calling for me to write after this conference. I have a million ideas in my little brain that I'm desperate to get into my computer and have been planning how to make this happen! If you've been to NCTE before, I'm sure you share my enthusiasm for this conference. If you've never been to NCTE before, I hope you don't feel too bad...there are lots of people tweeting at NCTE, just check out the #NCTE13 hashtag! Did you attend NCTE this year? What did you love about it? Or maybe you've attended another time? Are you thinking of going next year in Washington, DC or maybe the following year in Minneapolis? I definitely recommend it! 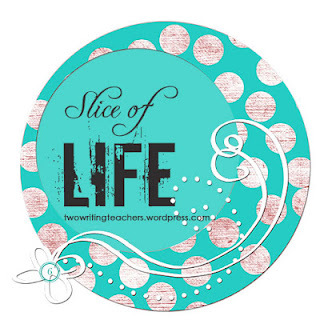 Wise Decor Decal Review and GIVEAWAY! Reading in the Wild Book Tour!